WARSAW — Eight teams covered the courts at Warsaw Community High School Saturday afternoon for the annual Warsaw Varsity Invite. Munster reigned supreme, winning the team title with 25 points while Penn took second with 16. Warsaw tied with Northern Lakes Conference foe Elkhart Memorial for third with 15 points. The Tigers were excellent in the tournament’s final rounds, winning all five of their matches. The highlight of the day for Warsaw was the team of Colette Smith and Athena Schlitt at No. 1 doubles. The duo took first place in their respective bracket by defeating Penn’s Aliya Bralick and Alexis Snelson 6-3, 4-6, 1-0 (10-8) in the championship match. Other first place winners in the tournament were Krystal Grubb (No. 1 singles) of Elkhart Memorial, Karolina Skora (No. 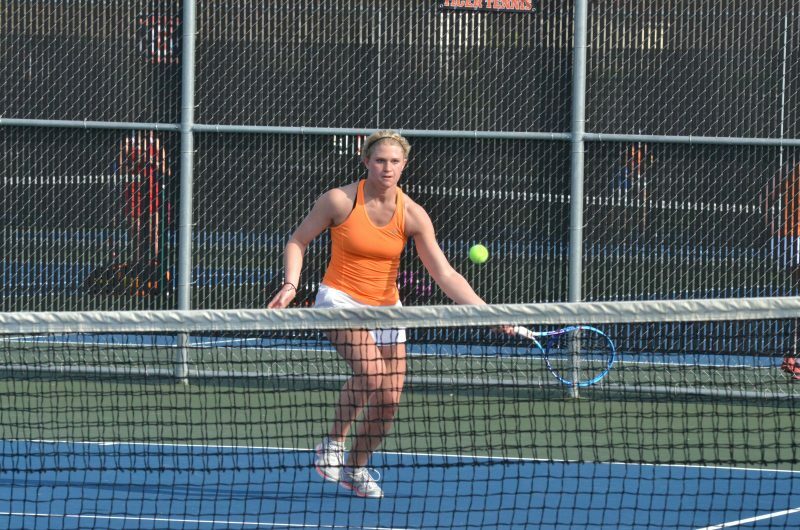 2 singles) of Munster, Kelli Canul (No. 3 singles) of Munster and the team of Hazel Wolf and Maria Delis (No. 2 singles) of Munster. At No. 2 singles it was Ella Knight giving the Tigers their second-highest finish of the day. Knight earned herself third place with a 6-2, 6-4 win over Laura Gerber of Penn. Liza Lewis and Alyssa Zellers each took fifth in their respective brackets. Lewis, the team’s player at No. 1 singles, won her final match with a win over Homestead’s Natalie Steingass 8-3. Zellers, meanwhile, won her last match at No. 3 singles with an 8-1 defeat of Lauren Peters, also of Homestead. The No. 2 doubles team of Rachel Boyle and Rachel Yeager defeated Homestead’s Shriya Jain & Dalena Trinh 8-3 to take fifth place in their bracket.